Triggered by the collapse of Lola's F1 dream in 1997, the FIA had tightened up the entry requirements to join F1, requiring any entries seeking to join at the turn of the new millennium to pay a bond of $48m, later repaid in instalments, to demonstrate financial security. This virtually priced all except manufacturer teams out of the market and, in the immediate years after, only Toyota emerged from scratch, as the large start-up costs put off even the largest marques from lodging new entries, instead electing to take over existing outfits. In 2008 and '09, the global financial meltdown and ensuing exodus of manufacturer teams gave F1 and the FIA the job of replenishing its dwindling grid, amid the unfulfilled promise of a cost cap. Of the four teams admitted, Lotus Racing and the Manor-run Virgin Racing squads made it, US F1 was a stillborn project, while Campos Racing's entry went through a difficult birth and ultimately ended up with adoptive parents. From the very beginning, the team toiled with financial pressures. Having budgeted for the cost cap, owner Adrian Campos's dream looked dead in the water, but a last-minute reprieve by Jose Ramon Carabante's Hispania Group provided the impetus to make the grid for the Bahrain 2010 season-opener - just, in the case of Karun Chandhok's hastily assembled machine - with ex-Midland chief Colin Kolles drafted in to run the day-to-day operations. Although its Dallara-built chassis were underdeveloped and lacking pace, the team managed to avoid the wooden spoon at the end of its first two seasons, beating the Manor-Virgin outfit to 11th in the constructors' standings in both years. Midway through 2011, Carabante sold up to Madrid-based investment company Thesan, which came in with the goal to drive HRT up the order while demonstrating a clear Spanish identity. Relying on Kolles's personnel to go racing, Thesan gave the Romanian his marching orders and went on a recruitment drive to bring more elements in-house. Ex-Minardi driver Luis Perez-Sala took up the reins as team principal, while the team moved its headquarters from Murcia to a new facility in Madrid. On the driving front in 2012, Narain Karthikeyan was re-signed for a second year having been benched mid-season to allow Red Bull to blood Daniel Ricciardo, while the experienced Pedro de la Rosa was signed to lead the team, bringing a wealth of knowledge from testing duties with McLaren and Pirelli to develop the car and boost the team's commercial presence. 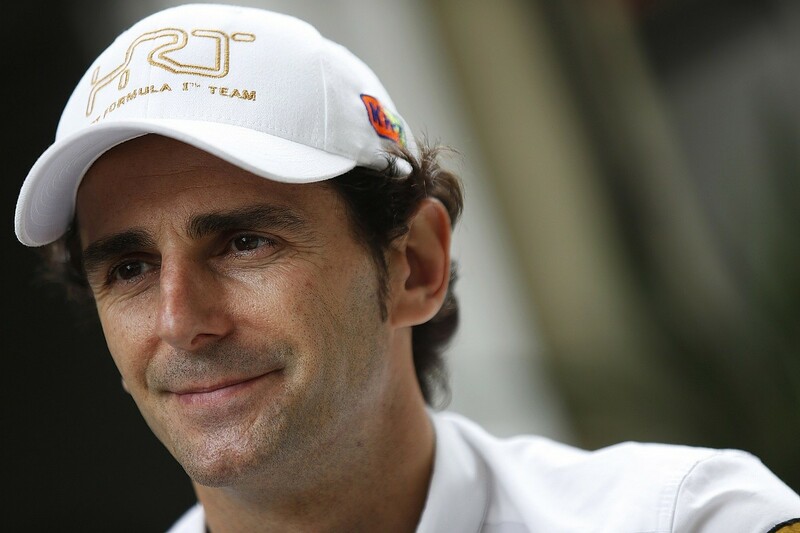 "I learned a lot from the management side and how complex an F1 team could be," recalls de la Rosa, who now works as a sporting and technical advisor to DS Techeetah in Formula E. "I was not just focusing on racing, because there were many other things I had to help with; I had to try to look for sponsorship, and there was also the fact that we moved the team to Madrid, which I also had to help with. "I remember the first time people asked me why I was going to HRT, and there were two reasons. The first was to continue racing, and the second was that it was a Spanish Formula 1 team. That was unique, [and if] I didn't help establish it then it might not happen again. I knew exactly where I was going and the difficulties we would be facing. I knew that it was going to be hell, but it was hell with a group of very committed people." The F112 was hardly a significant departure from its predecessors, although some time had been spent in the vehicle dynamics lab to understand the F111's chronic lack of grip. Nonetheless, it was late in arriving - HRT attended pre-season testing with the old car, as the new design failed the roll-hoop and lateral nose crash tests needed to run. It was another difficult birth for the team, and the long-awaited F112 finally made its on-track debut in a Barcelona shakedown. Dressed in a white, burgundy and gold livery, HRT's new chariot was a very conservative, functional design with little in the way of innovation. This was hardly surprising given its diverse roots, having been outsourced across Europe. The design, development and construction had been produced by Munich-based Holzer, and the chassis was put together by UK-based Formtech Composites. Stress-analysis simulations were carried out in Portugal, leaving HRT's new technical chief Toni Cuquerella to tie everything together from various European industrial parks. It was far from ideal to lift the team off the back of the grid. Avoiding the aesthetically challenged stepped noses of the time - a result of the FIA's lowering of the front crash structures - the car looked a lot more clean-cut than some of its counterparts, but just overwhelmingly basic in comparison. In particular, the front wing seemed to have changed very little. In 2012, the complexity of the designs began to increase as aerodynamicists started to explore the realm of element curvature and vortex tunnels. Conversely, HRT's wing featured a trio of slats, still rooted in designs akin to those seen in '09 and looking rather utilitarian against the competition. There was also performance left on the table through packaging, most noticeably at the rear end. Most teams had emerged from the 2011-12 off-season with a pronounced Coke-bottle effect at the back as the sidepods tapered in around the rear wheels. Even with a Williams-produced gearbox on board, which was kept as small as possible for the FW34's tight rear packaging, HRT's geometry was considerably more chunky. However, the rear wing was completely overhauled, dispensing with the long-chord top flap for something smaller to boost the airflow attachment across the wing - especially in transient conditions when the DRS was activated. Having briefly considered a switch to Ferrari power, budget constraints ensured that HRT continued with the cheaper Cosworth engines - derived from the fast-but-fragile units used by Williams in 2006. Like back-of-the-grid rival Manor, now renamed Marussia and also using Cosworth power, HRT chose not to complicate its car with the addition of KERS. "I was quite surprised by the Cosworth," de la Rosa says. "It was very reliable. I would say the engine was not on our list of issues. OK, it had less power than the Mercedes and probably the others as well, but if you put that engine in a competitive car it would have been a decent package. "Let's not forget that we didn't have KERS either, and that was at a time when everyone was running KERS. But we thought that the extra few tenths it was giving you was not worth the €1.8m, because we had other time gains to invest our limited budget on." Those gains appeared in the form of a new aero package at the Spanish Grand Prix, after the team had propped up the field in the opening flyaways - and failed to qualify both cars at the Melbourne season opener for a second successive year. The front wing featured a larger, more shapely top flap, yielding more contemporary airflow management ahead of the front wheels. Sure, other teams had ventured into three-element wings, but HRT was now consistently closer to the Marussia cars with the upgrade - which also included a new bargeboard package and revised rear-wing endplates to control vortices. "In terms of set-up," recalls de la Rosa's race engineer Mark Hutcheson, who had joined the HRT rebuilding project from Marussia, "it was OK, a normal car from that point of view. The main limitations in all these teams is that you have ideas, but you can't implement those ideas in the same way as everybody else because you've got a budget limitation. "HRT was very limited. 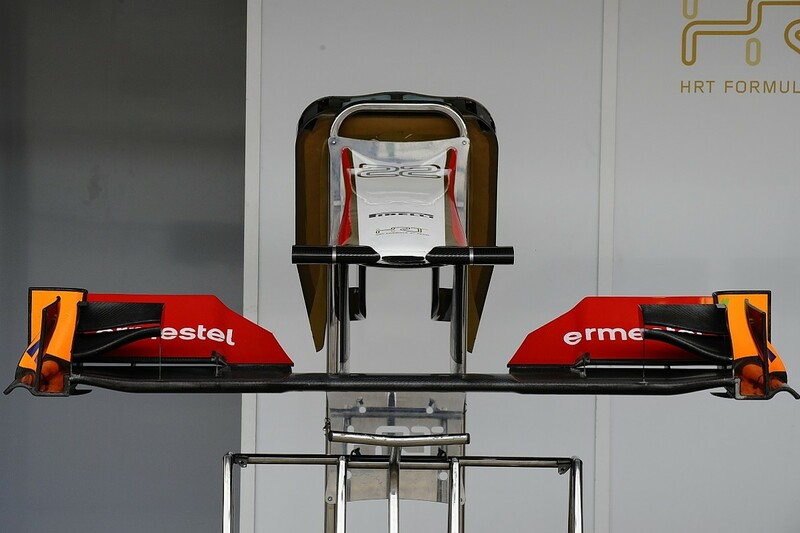 We maybe only had one floor update through the year and three front-wing updates. If you consider in the same year Red Bull were on front-wing update number 30 or 40, you can see the difference. It's not that the team doesn't know what to do or have any ideas, but there's a limit to what you can do." "We had a €46m budget and 85 people," adds de la Rosa, "including the marketing department and administration - it was incredible to have a team running with this budget. The group of people I found there... if people ask me, 'What is the difference between HRT and McLaren?' I say the quantity. The quality of people in these teams is outstanding." 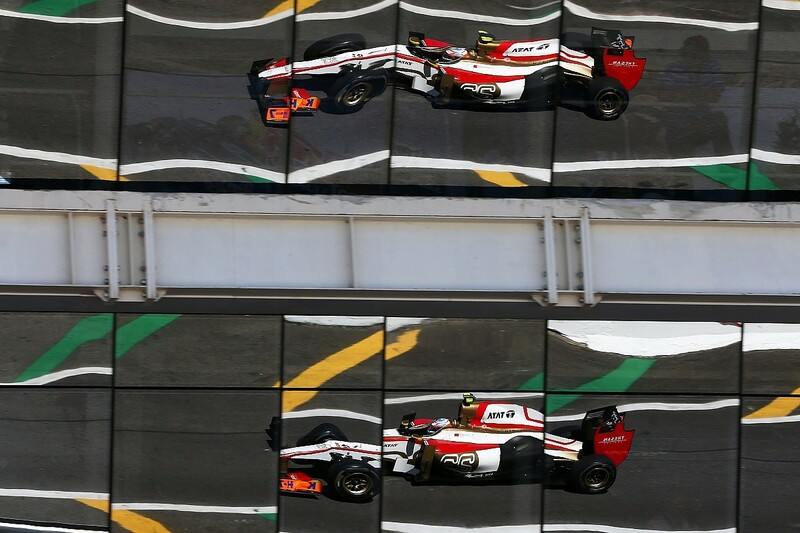 Next time out at Monaco, where HRT's shortfall in downforce was at its most pronounced, de la Rosa plonked himself ahead of Marussia's Charles Pic in qualifying and within two tenths of Pic's team-mate Timo Glock, producing "one of the best laps I've done in my F1 career". It counted for nothing though, as his race was over on the first lap after Pastor Maldonado rode over the HRT's rear wing. 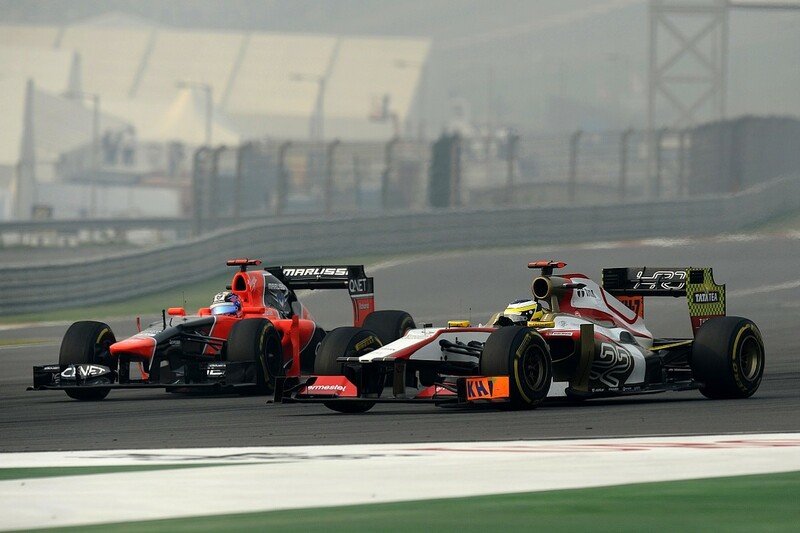 Karthikeyan, meanwhile, rescued the team's best result in a twice-lapped 15th place. The team had neither the budget nor the resource to continue its development, having outsourced the entirety of its aerodynamics department, so began to turn its attentions to 2013, with de la Rosa and Hutcheson both set to continue. Development of the F113, intended to be an evolution of the '12 car, began in earnest under the guidance of new chief designer Mark Tatham. Then reality started to bite. 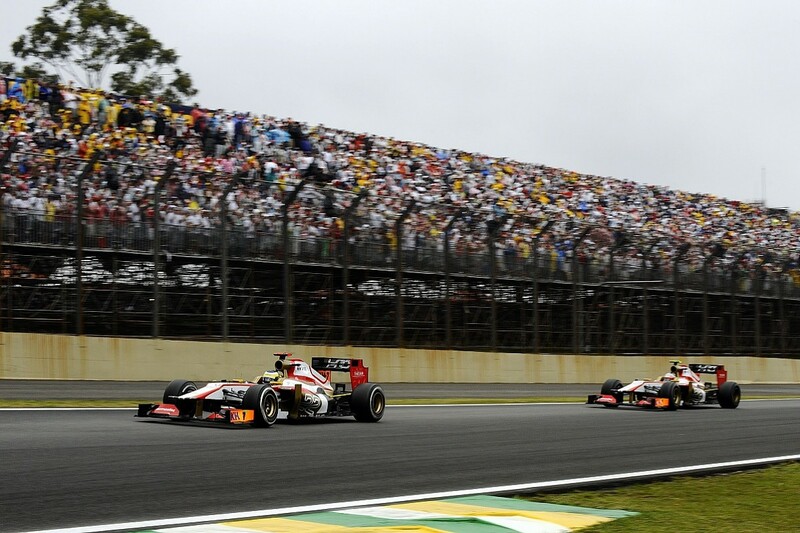 A perfect storm of Spanish financial meltdown, the banking crisis, and a hangover of the global recession continued to unwind into 2012 and quelled HRT's attempts to find solid sponsorship. Looking towards '14 and the introduction of turbo hybrid V6 power units, HRT's financiers were considerably turned off by the massive investment required. With no low-budget option available - Cosworth had decided to pick its ball up and go home rather than try to compete in a high-budget exercise - and no other investors forthcoming, Thesan Capital pulled the plug. "The biggest regret I have is that the turbo era caught us in the middle of the project, and the big Spanish crisis of 2012 hit us hard," says de la Rosa. "There were many factors, but we were really in serious conversations with [potential Spanish sponsors] and then in '12 we had the banking crisis and it was very difficult to get any sponsors at all. Everything conspired against us. "I feel very sorry about it, because I knew that if that project died, I would never in my lifetime see another Spanish F1 team. When I told Ron Dennis I was leaving for HRT, he didn't even know what the name of the team was! Then he said to me, 'You must be nuts!' and he left the room. But that's what I wanted to do! [He was] right, but I think there's a time in life when you have to do what you think is right and that's why I don't regret it." The remainder of 2010's 'new teams' passed in the succeeding years. Caterham (formerly Lotus) bit the dust at the end of '14 despite a concerted crowdfunding effort, while Manor survived falling into administration only to bow out two years later when Sauber snatched 10th in the '16 constructors' championship by one point. With costs of the current powertrains sky-high and the level of engineering needed to be competitive also requiring massive capital, talk of a budget cap persists. Unless hell freezes over and the championship's grandes fromages agree to cut and limit costs, could the HRT F112 be the last true budget F1 car? As things stand, it certainly looks like it. This feature first appeared in January's Autosport Engineering supplement, which includes an in-depth profile of Williams Advanced Engineering, an engineer's guide to designing a Formula 1 car on a budget and a look back at the engine wizard behind Audi's LMP1 success. Out every other month, the next issue of Autosport Engineering will appear on March 14.